It is hard to take care of existing customers. I have worked in many sales teams. I also help sales, customer retention and success teams everyday. And only a small fraction actually manage to take great care of their customer base. Those who do have the right marriage of processes, people and tools. Being able to automatically call customers is one key capability. And it has to be integrated with other tools and processes. When customers stop buying from you, what’s the reason? Bad processes? Bad experience? Rude staff? Cheaper competitors? Those are all problems to look out for. However, even though 67% of consumers cite bad experiences as a reason they moved to a competitor, only 1 in 26 dissatisfied customers actually complain. If you don’t proactively reach out, you’ll never even get the chance to learn about a grievance. Churn is just a part of the typical customer lifecycle. But does that mean you need to accept a high churn rate? Definitely not. This has everything to do with sales acceleration. It costs five times as much to attract a new customer as it does to retain an existing one – so old customers are still good for new sales. Increasing retention is among the most substantial contributions a business can make to improving its bottom line. 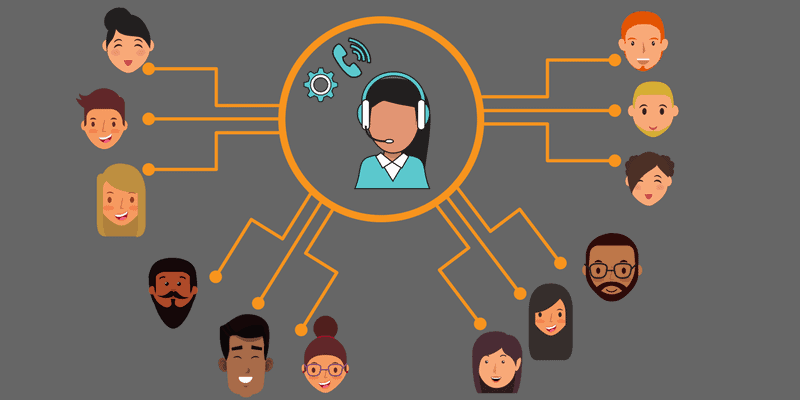 They simply need to build greater retention activities into their dialer behaviours – not only for customers who express dissatisfaction, but as customers approach the end of a typical customer lifetime. It only takes minimal contact from a skilled agent to solidify a customer’s relationship with your brand. This very simple outreach strategy would be a big project without a sophisticated dialer integrated with CRM and other resources. But with the dialer and API integrations in place, it takes very little effort. Widely reported research has demonstrated that a 5% increase in customer retention increases profits between 25-95%. We think that sounds pretty worthwhile, how about you? Why don’t most teams manage the process well? Usually it is not because the sales or customer success experts are bad at their job. It is almost always because the team have failed to go the full mile. There are loose ends to processes that allow things to unravel. Yes, it does take incredible discipline to map out workflows and experiences. It takes a lot of detailed hairsplitting to follow through each data flow and then make them work efficiently across integrations. But that is what is takes. The good news is that if you do have that discipline, then it has never been easier to achieve what you want. I say to our customers: “Forget constraints. There are none!” Nowadays, there is no integrated automated workflow that cannot be built cost effectively. The only constraint is how far you go in pursuit of the perfect machine-assisted processes. Get creative! On the specific topic at hand: It is perfectly feasible to quickly get to the point where your systems all collaborate to spit out automatic correctly ranked and correctly scheduled contact and call lists for the right staff at the right time. It is also not an issue to automatically assign the tasks and automatically connect the calls. The great thing is that not only keeping in contact with customers becomes easier when you tackle this kind of project – there are many other benefits. This is the second in a series of posts on what we have learned from helping lots of customers accelerate their sales. In the first post on the benefits of a dialer, I talked about how a well-integrated dialer can help to seriously accelerate your sales thanks to an increase of the quantity of outbound calls your agents can make. That was only one benefit. This post is looking briefly at how businesses can benefit from building the discipline of getting back to the right customer at the right time into core processes. In subsequent posts, we’ll look one by one at each of the business benefits related to automation using integration and a dialer.